A black and white portrait photograph of James Benjamin Bickell. 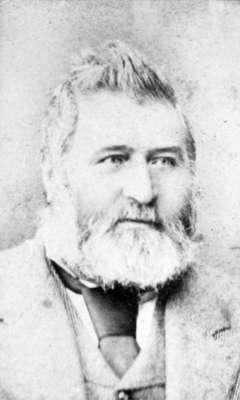 James Benjamin Bickell was born in the parish of Stowford, Devonshire, England, on December 7, 1826 and came to Canada at age 17, in 1843. His family settled in the vicinity of Peterborough. James Benjamin Bickell then moved to Bowmanville and went into the milling business. About 1861 he moved to Brooklin and operated a grist mill on Lynde Creek, south of Way Street. Some time later the creek came to be known as Bickell's Creek. Mr. Bickell served as a Whitby Township Councilor in 1862, 1865-1866 and was Reeve of the Township from 1863-1864, 1867-1868, and 1872 to 1881. He was elected Warden of Ontario County in 1868. He was a Mason and a Master of Mount Zion Lodge, Brooklin, in 1867-1868. He was also an officer of the Grand Lodge of Canada, a member of the Sons of England and several other societies. On March 18, 1881 the Bickell Mill was destroyed by fire and in 1882 James Benjamin Bickell moved to Toronto to form a partnership in the tannery business with Samuel Robert Wickett, another Brooklin industrialist, whose tannery in Brooklin also burned down in 1881. He died at Toronto on November 20, 1891 and is buried at Bowmanville cemetery. This photo is in a frame of Ontario County Council Portraits.